To celebrate its partnership with Chicago and its incredible location in the heart of theatreland, The Waldorf Hilton has gone above-and-beyond with its culinary offering to give its guests a night to remember. The iconic hotel has designed a special Chicago cocktail menu at Good Godfrey’s Bar & Lounge, inspired by hits from the famous musical. They’ve also revamped its pre-theatre dinner so that guests can indulge in the likes of rib-eye steak, Scottish smoked salmon and The Waldorf Eton mess, before heading off on an evening of spectacular razzle-dazzle and jazz this weekend in London. Rosewood London and leading activewear brand lululemon are inviting guests and Londoners alike to celebrate Global Wellness Day with a jam-packed day of activities and food that is sure to whet the whistle of the city’s wellness warriors. From yoga classes and inspirational talks to HIIT sessions, a healthy breakfast and a lululemon pop-up shop, the expertly curated itinerary and amenities offer opportunities for both revitalisation and relaxation. Get ready to hit refresh. 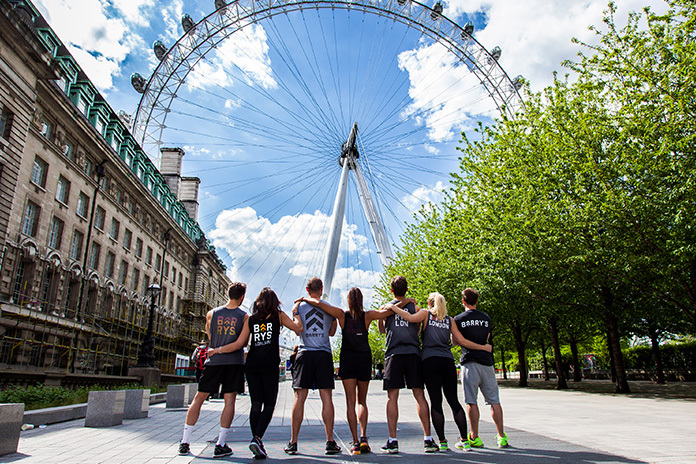 For the third year in a row, world-renowned Barry’s Bootcamp will be commandeering the London Eye to bring its famous HIIT workout to the Southbank. The 150 tickets are getting snapped up fast, so if you’ve not got yours already, what are you waiting for? All proceeds will go to Stand up to Cancer and the event promises a fun-filled way to experience one of London’s most iconic destinations and views, while getting a fitness hit. Barry’s x The London Eye is taking place on Saturday 9 June from 7.30am and tickets are £60pp, with all proceeds going to Stand Up to Cancer. Covent Garden is flourishing this summer as the area welcomes London’s largest outdoor floral art gallery to the estate. Until 24 June, visitors can enjoy Covent Garden in Bloom, a conceptual pop-up garden installation located on the east piazza. Balthazar Boulangerie, Hotel Chocolat and Sweetheart Cupcakes will also be on hand to tempt visitors with summer themed sweet and savoury treats. The concept comes as part of the Chelsea Fringe celebrations and is the perfect place to spend a sunny Sunday afternoon. Instagrams at the ready! To celebrate one of the most talked-about exhibitions of the year, Frida Kahlo: Making Her Self Up, The Lanesborough has gone above and beyond with its latest culinary offering. Inspired by the colours, shapes and textures of the life of the Mexican artist, the Frida Kahlo-inspired tea offers a playful twist on the traditional Lanesborough afternoon tea with passion fruit and raspberry eclairs, a margarita baba, a Mexican chocolate tartlet and more. Feasting begins with a taste of Agua de Jamaica, the classic Mexican water flavoured with hibiscus, and can be washed down with a Mexican spiced hot chocolate. Market Halls is the exciting new culinary concept redefining our idea of the food hall and turning London’s unloved spaces into new foodie hotspots. The first site in London brings a taste of the city’s east side to west with the likes of Calcutta Canteen, Yard Sale Pizza, Press Coffee and more setting up shop in a Grade II listed former Edwardian ticket hall of Fulham Broadway station. These street food stars are joined by the best of British craft beer and spirits, making it a one-stop-shop for all your gastronomic needs. We’re making most of the sunshine while it’s here at London’s newest and coolest hotspot, The Coral Room. This new cocktail bar and all-day-dining space offers one of the most extensive English sparkling wine menus in the country and is celebrating this, along with the start of the long-awaited British summer, with exclusive tastings in their secret outdoor space – The Coral Garden. During the tasting, guests will learn about and sample six different English sparkling wines, handpicked by the bars award-winning Master of Wine, Anne McHale. The perfect way to while away a weekend in the glorious sunshine. As the wellness industry goes from strength-to-strength, Westfield welcomes The Lifestyle Lab to its Stratford City centre; a wellbeing pop-up encouraging Londoners to nourish their body, mind and soul. With leading wellness experts, prize-winning technology and the first dining experience from The Body Coach – The Joe Wicks Cafe, visitors will have the opportunity to take a 360 approach to their wellbeing, from eating for fitness, to free exercise classes and even measuring the body’s antioxidant levels.